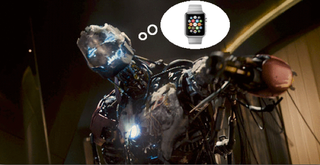 We could talk about the Apple Watch. We could also talk about nothing related to the damned watch. Happy Friday, Gizmodo. What’s on your mind? I’m ready for the weekend, in which my scintillating plans involve sleep, sleep, and some more sleep. In honor of Age of Ultron bowing soon, I’m also planning to read some classic Avengers comics to rev myself up into proper levels of excitement. I’ve spent the week telling my friends who got into highly-selective AoU press and fan events that they are dead to me. While the MCU films can be hit-or-miss, they’re on a pretty good streak lately, and I’m a fan of the first Avengers film. Considering that the villain this go ‘round is a super-robot and there’ll be a lot of “science” as rendered by Bruce Banner and Tony Stark, I’m hoping there’ll be cool Gizmodo-worthy content to be mined. So: sleep and comics. That’s the weekend for me. Tell us what you’re looking forward to, or, if it’s been a crap week, let’s raise a glass and celebrate its eminent demise.